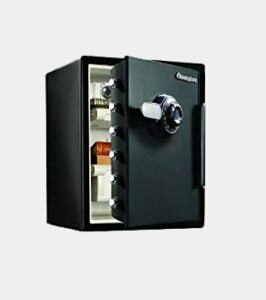 Are you searching for the best combination safe reviews? 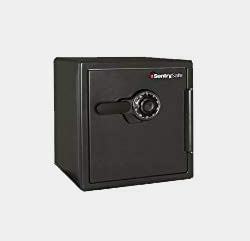 There are many gun safes online, but the quality varies from the high quality to poor. To help you decide, I’ve looked over the top combination safes so you can get maximum value for your money and of course provide security. I also have buyers’ tips here, so let’s start. If you want a good combination gun safe, you have to consider its features and capabilities. A combo safe is no longer just for guns as you can use a well-made safe to store jewelry and other valuables. A combination safe keeps your firearm or valuables secure, and they’re also easily accessible. Aside from solid construction and security, many are water resistant and have fire protection. 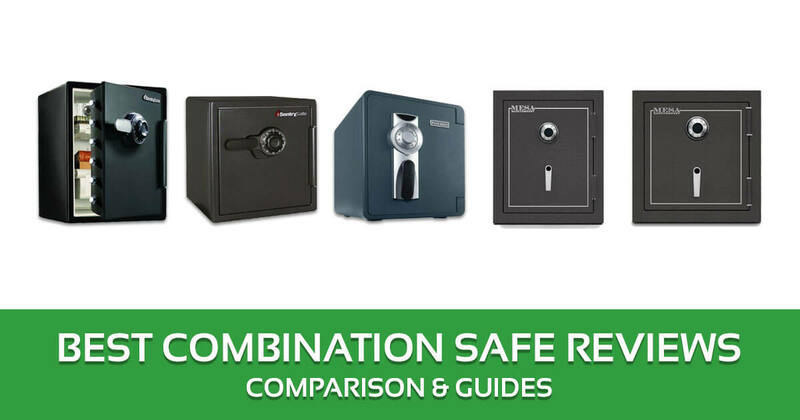 These combination safes are more versatile than ever, and in the following reviews I’m going to show you what features make for the ideal safe. If you’re looking for the best combination gun safe you have to consider the following factors. Combination safes come in all shapes and sizes. If you’re going to place a rifle in it, the interior must have enough vertical space for the standard 52 inch rifle. Gun safe width has to be 35 inches minimum for long firearms, and the wider the better if you’re going to store several firearms. Large gun safes are great for long firearms, but impractical for pistols. Small gun safes are portable and easy to conceal. Solid steel and continuous welding are preferable as they’re more durable. Avoid low cost safes that use combustible material. Safes with plastic components should be avoided. Thick walls are ideal as they’re harder to drill through without making a sound. Safes use different types of locking systems ranging from electronic, to dial and a combination of both. A combination electronic and dial lock provides additional security. Some combination safes also have keypad controls built in. If you’re going to purchase a combination electronic safe, make certain the keypad is durable. A well-made safe is fire resistant to some degree. Look for a UL fire resistance rating of at least 350 F for 1 hour. Some fire resistant safes have waterproofing and anti-leakage properties. The most widely used insulation for fire is sheetrock. Ceramic wool is also used in more expensive safes. You should also consider the layout, i.e. if you can remove the shelves inside to rearrange the items. Some of the more advanced safes even use biometrics for enhanced security. Other features you may want to look into are anchor holes, override lock and pry resistant components. Here are the top 5 safes I recommend. The SFW205CWB is one of the best home combination safe today as it gives you security and peace of mind by keeping your firearm safe. There is also space inside for other valuables. With an interior of two cubic feet, you can place a lot of items here without cramming. Filling the safe also increases its weight and provides additional protection. Its UL fire protection rating also makes the SFW205CWB ideal for storing valuables and jewelry. It is also suitable for memory sticks, media storage devices and of course firearms. The bolts used are larger than those found in standard safes, and the rest of the safe is built for long term use. The SFW205CWB is made from heavy duty steel, and it’s going to take a lot of effort to move or lift the safe. With its 6 one inch bolts, there is an extra level of security built in. There is more than enough space here for your gun, ammo and other valuables. The layout also makes it easy to arrange the items as you like. The tray and organizer are both adjustable. There is also a compartment, key rack and door pocket for small items. This safe has been built to withstand a two story fall, and the hinges are also pry resistant. 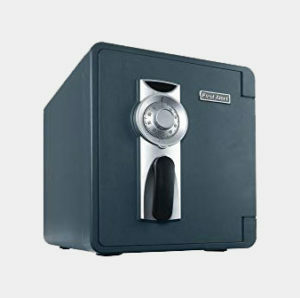 This is one of the best combination safe under $500, and its roomy interior and lock will keep the items inside secure. Combination safe reviews have given the Mesa Safe MBF2020C positive feedback, and it’s well-deserved as the safe has the features necessary to keep your firearm secure. While built mainly for your gun, the security features in the Mesa are enough to protect your valuables too. Because the MBF2020C is heavy, burglars won’t be able to lift it without a struggle. What’s even better is you can bolt the safe, and there is a drill resistant plate built into the safe as well. The MBF2020C is made from heavy duty steel, and the 4 inch door is resistant to fire. The body also has dead bolts and locking bolts 3 inches in diameter. The safe has UL fire resistance rating of 2 hours, so if there’s a fire your valuables are protected, and the safe can withstand a fall of up to two stories. The steel hinges provide extra protection, and the safe can withstand up to two hours in 350 F.
In fact the safe has been tested in up to 1830 F, and that tells you how durable the safe is. The safe has 3.3 cubic feet of interior space, giving you enough room not just for your firearms but other paraphernalia and items you want to store. The shelves are upholstered and it also has a seat with a heat activation feature. The MBF2020C is an outstanding safe that combines roominess with security, and it’s hard to find a better one in its class. The first Alert has also gotten some of the best combination safe reviews, and I am not shocked as it is well-designed. It is sold in two variants and both are solidly constructed and provide lots of flexibility. Like the other safes here, the First Alert is perfect for safeguarding digital and electronic media. From USB drives to discs, documents, cash and so on, the First Alert keeps them secure and accessible at the same time. Unlike simple safes, the First Alert uses both key and combination, giving your firearm and other valuables extra protection. This is in addition to its heavy duty construction. The safe is built from heavy duty resin, and it comes with Delta hinges that burglars won’t be able to pry off. There are also 4 heavy duty bolts on the door, and you can adjust the shelf to suit your needs. The First Alert has a 4 digit combo lock, and there’s also a key included for added security. The inclusion of an emergency override key ensures you’ll be able to access the safe even if you forget the combination. The Underwriters Laboratories (UL) has classified this as resistant up to 1700 F for one hour. It also has a waterproof seal so the contents remain dry even if the safe is immersed in water. The First Alert is not as large as the other safes, but if you just need a compact safe, this will get the job done. The SentrySafe Combination Fire-Safe was designed for those who want their firearm safe and sound. As one of the top combination safes for the home, the SentrySafe provides high level security for anything you put inside it. The SentrySafe doesn’t come with a key, but its mechanical dial lock offers enough security. Once locked, your documents and cash are safe and no one will be able to access it. The safe is made from solid materials and can withstand drops from up to 15 feet. Even with repeated pounding the safe won’t give in, and that’s indicative of how resistant its built is. The SentrySafe is also UL rated for 1 hour fire protection, and it is also reasonably heavy for its type. With these specs you’ll be assured your stuff is secure. The mechanical lock is easy to use, so in case of an emergency or break-in you can quickly open the safe and access the contents. Unlike other safes that require multiple confirmation, the SentrySafe puts emphasis on accessibility. The SentrySafe does not make a lot of noise. Other safes make loud sounds when you press the keypad, but the SentrySafe won’t make any sound when you open it. One of the more common problems with safes is they make a lot of noise, so the fact that this is silent is welcome. The SF123CS is one of the easiest safes SentrySafe has released. No need to use memory any long codes or use keys, as the combination lock is all that’s required for access. If you’re in the market for the best affordable combination safe for your gun and few other items, the SF123CS is worth considering. It is low key but effective for storage and security. 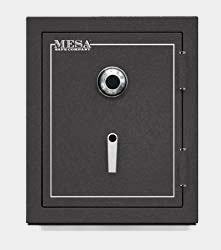 The Mesa Safe MBF2620C is a high end gun safe with combination lock. With 4.1 cubic feet of interior room, it is one of the most spacious safes in its range, and while other safes can only store a limited number of items, the Mesa MBF2620C offers a lot more. You can put the safe anywhere you want, but for added security it is best to bolt it on the floor or wall of your bedroom. This is easy enough to do as the complete anchor kit is included in the safe. The MBF2620C has the features you’d expect from a high quality safe, and we will look at them shortly. The U.L. Listed Group 2 Combination Lock is very resistant to prying. Once the combination is locked, no one will be able to open it unless they have the combination. What it all comes down to in safes is the locking mechanism, and the MBF2620C does not disappoint. Once it’s locked only those who know the code will be able to access the items inside. The safe comes with shelves that you can adjust to fit the contents inside. The shelves also act as dividers so you can arrange the items inside neatly. Like the other Mesa Safes, the MBF2620C is an all-purpose safe so you can use it for any valuables you have in mind. Its higher than average fire protection and capacity are certainly pluses. The Mesa Safes are known for their quality and this is no exception. Solid steel is used in the construction and the door is 4 1//2 inches thick, and additional safety features include 3 inch diameter dead and lock bolts. If you’re looking for a high quality combination safe and price isn’t a concern,the MBF2620C is a good bet. Having the best combination lock provides you with a lot of benefits over the standard safe. Durability: these safes are constructed from high quality materials, and they’re built to last a lifetime. Security: the locks are secure and can’t be pried off easily. Plus many provide additional layers of security to keep burglars at bay. Spacious: as I mentioned above, the top safes provide storage for your guns and other valuable items. Instead of buying a separate safe for your other valuables you can store all of them in one place. Easily Accessible: safes keep your firearm safely locked, but they’re within reach. By placing the safe on your bedside, you can quickly get your gun in case of an emergency. Peace of Mind: if you’ve got kids in the house, a gun safe is necessary, and even if you don’t, a safe ensures burglars won’t be able to get to it easily. Conforming to State Laws: in some states you’re required to keep firearms in a safe, so having one ensures you’re following the law. Fire Protection: having your most valuable possessions in a fireproof safe is going to make you feel safe and secure. Even the best combination handgun safe won’t last if it’s not handled properly. Though safes don’t need a lot of maintenance, the following does help. Read the owner’s manual: a lot of the problems users encounter stems from the fact they haven’t read the manual. This is especially true if you’ve got a combination / electronic safe. Store in a safe location: place the safe by your bedside, and bolt it to the floor or wall if possible. Don’t leave the safe in the open for everyone to see. Limit Access: the safe is only as effective as you’ll allow it. Limit access only to those you trust with the contents. Test the Safe: try out all the features of the safe before putting anything inside. If there are problems, return it to the manufacturer or the website you bought it from. Use the Safe Properly: if the safe is meant for use only in a specific way, do so. Also, don’t leave the safe near highly combustible objects even if it is fire resistant. Clean the Safe: clean the safe and its contents every couple of months or so. What if I lose my lock combination and or keys? You have to contact the dealer where you bought the safe. Make sure you’ve got your safe serial number and other details so they can provide assistance. This is the same process if you lose your safe keys. How do I change the combination lock? This feature is available in gun safes with keypads, and requires you to enter the default combination first. Once the combination has been accepted, there is an option to change the keys. What does UL resistance mean? The rating refers to how long the gun safe can protect the contents in case there is a fire. Most gun safes have a UL rating of 350 F and good for 1 hour, but there are many other safes which have a higher fire resistance rating. What does safe routine maintenance mean? This is the routine used to keep the safe’s lock in good working condition. This is a job for certified locksmiths only however. Can all firearm safes be used to store valuables? Yes, and there’s usually enough space for your gun and valuables. My top choice is the Mesa Safe MBF2020C. It is well constructed, and there’s more than enough here for your gun and other items you want to safeguard. Its biggest advantage over the others is its layout, as it provides greater flexibility be it for guns, books, documents, jewelry and so on. 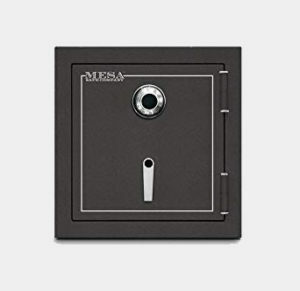 The Mesa Safe MBF2620C is larger yes, but it’s also more expensive, so the Mesa Safe MBF2020C is a good compromise between price and security. I hope you find the best combination safe reviews here useful. With a little research it won’t be difficult to find the ideal gun safe for you.